Since I’m doing the 31 day writing challenge about slow cooker recipes, I’ve decided to have the majority of my meals be cooked in the slow cooker. I don’t include Saturdays and Sundays on the menu because weekends are always up in the air with what we actually eat. 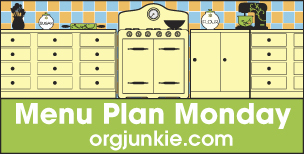 This post has been linked to Menu Plan Monday @ I’m an Organizing Junkie. On Mondays during the challenge, I’m going to feature a recipe from my blog and another blog that features slow cooking. This way you’ll see more of my blog and you’ll get to check out another blog. The week of October 19th, I’m going to feature several recipes from my blog because that week is parent teacher conference week. That week is a rough week so I’m going to adapt what I’m going to blog that week. As I was perusing the Internet for recipes, I found The Magical Crockpot. I’ve only started looking through all of the recipes she has so I’m going to list two recipes that have caught my eye. New Year’s Day Black-Eyed Peas – This would be good with the Pork and Sauerkraut I make for New Year’s Day. Chicken Philly Cheese Steak – I love the Great Steak and Fry Company. The one at the local mall closed down so I can’t get my fix. 😦 My favorite sandwiches were a chicken with pineapple and the chicken cheese steak. This recipe would be a way for me to get my fix at home. I would pair it with homemade French fries. If enjoyed this post, please share it with others. Also visit my Facebook page.